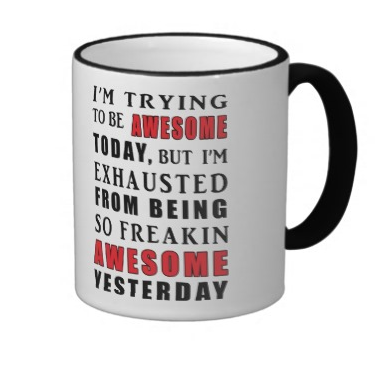 "I'm trying to be awesome today, but I'm exhausted from being so freakin awesome yesterday." I don't really need to say that much about this mug - its silliness speaks for itself. It's not big and it's not particularly clever and it's not even very pretty, but I can think of a fair few of my friends who would very much enjoy drinking out of this at their desk on a rubbish Monday morning. I actually found this via Angela Metcalfe, one of the wine industry's very nicest and funniest people, and someone I'm glad I found. She also runs a pretty funny Facebook page called The WineBitch that I highly recommend you visit. She, in turn, found this via a singer called Diana Rouvas, who also has a pretty fun Facebook page full of lots of inspirational pictures and nice shoes. Yay for finding brilliant new people. 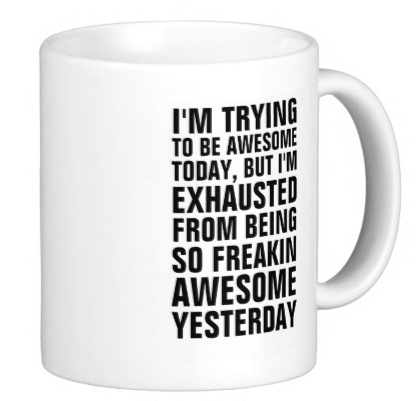 Anyway, the 'I'm trying to be awesome' mug comes in two different designs - as well as black and white, it also comes in a more colourful version. Hooray! And they're both £12.95 from Zazzle. Do you like this mug? Either way, you should probably check out the rest of the Monday Morning Mugs series. If you like them as much as I like finding them, then it should get your week off to a flying start.